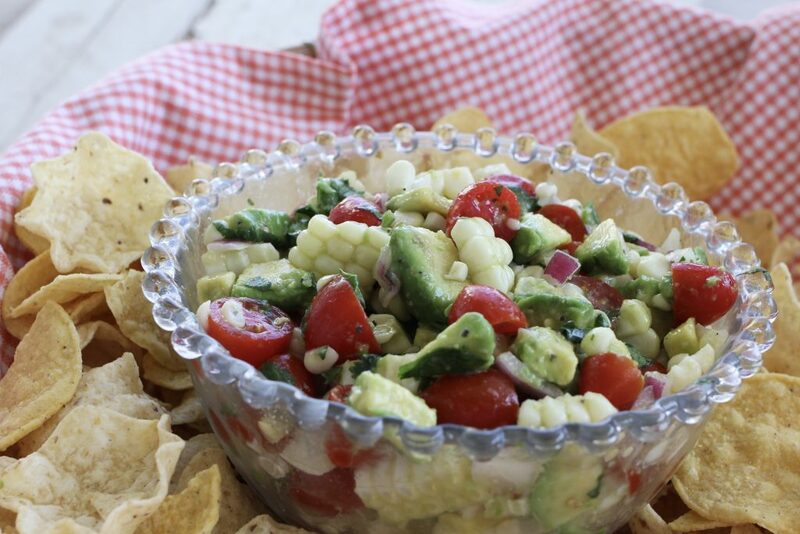 Have you noticed how good corn is this summer? This is a good corn year. I also think it’s a good watermelon year. If you care. I remember my parents talking about things like “good corn years” or “good cantaloupe years” when I was young. Of course back then I poo-pooed it off as being old person’s talk. Now I get it. There are good years for fruits and veggies, depending on how much rain we get during the year, the amount of sun shining, early freeze etc. I’m not sure what makes a good corn year, but I’m telling you, 2016 is a good corn year! Maybe I get a little carried away when I start loading corn into my cart because I know it only lasts for a couple of months? I’m not ashamed to admit for a couple of months of the year, I’m a corn hoarder. 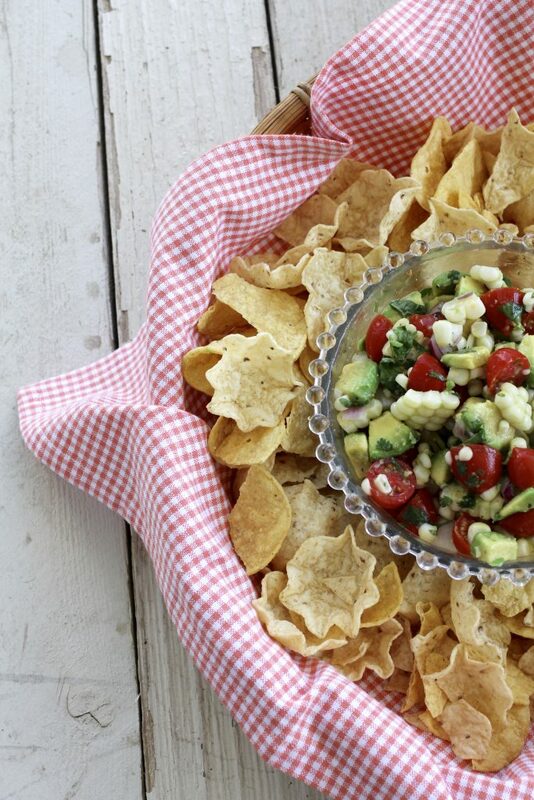 If you’re a corn hoarder too, you’ll love Quick and Easy Corn, Tomato and Avocado Salsa. 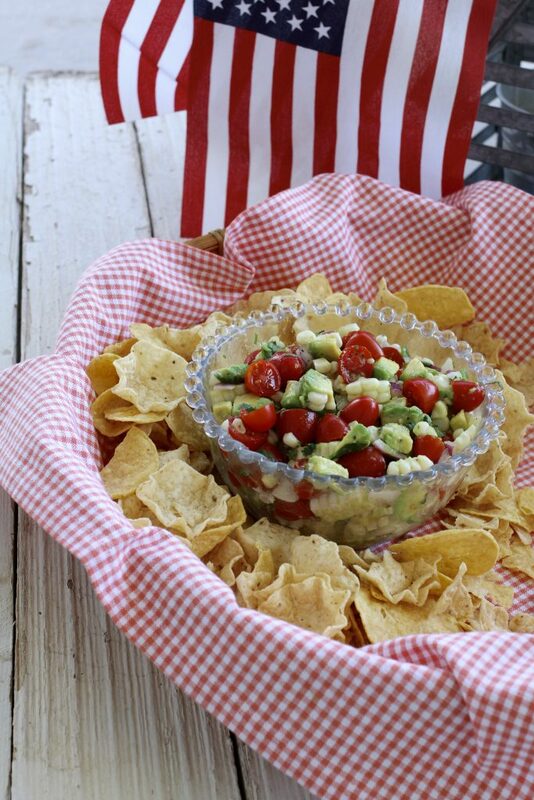 Quick and Easy Corn, Tomato and Avocado Salsa is one of the best dishes you’ll eat this summer. I promise. Happy 4th! To cook corn: Husk the corn and remove any silk. Place corn on cob in a large pot, cover barely with cold water. Place lid on pan and bring water to a boil. Set time and boil for 5 minutes. When done, remove from heat and drain water from pan. For this recipe, immediately fill the pan with COLD water to stop cooking process and cool corn. Place corn on a cutting board, and cut the corn from the cob. Place the corn on a plate or bowl and put in refrigerator or freezer while chopping rest of ingredients. Cut the tomatoes in half if using cherry or grape tomatoes, if using Roma tomatoes, cut into chunks. Place in large bowl. Squeeze the juice from the limes directly onto the avocados in the bowl. 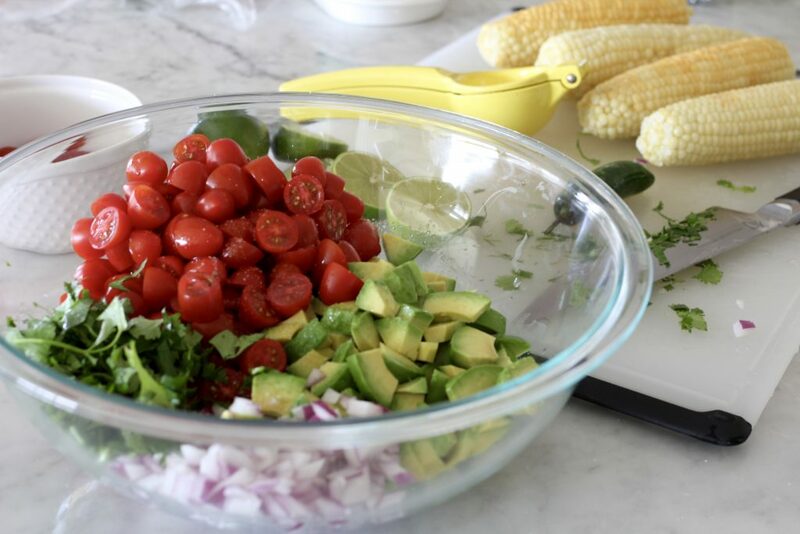 Add cooled, chopped corn to bowl. Add chopped jalapeño, cilantro, garlic salt, salt and pepper to taste. Serve immediately or place in refrigerator up to 8 hours before serving. -* the spice in this recipe will vary according to how many seeds you leave in the jalapeño, If you do not like spice, remove the seeds. If you like your salsa hot, leave a few seeds in the jalapeño. I HIGHLY recommend using food handlers gloves to chop the jalapeño. 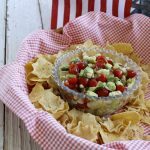 -When choosing avocados for this recipe, I like avocados that are barely rip, or barely give when pushed in with finger. 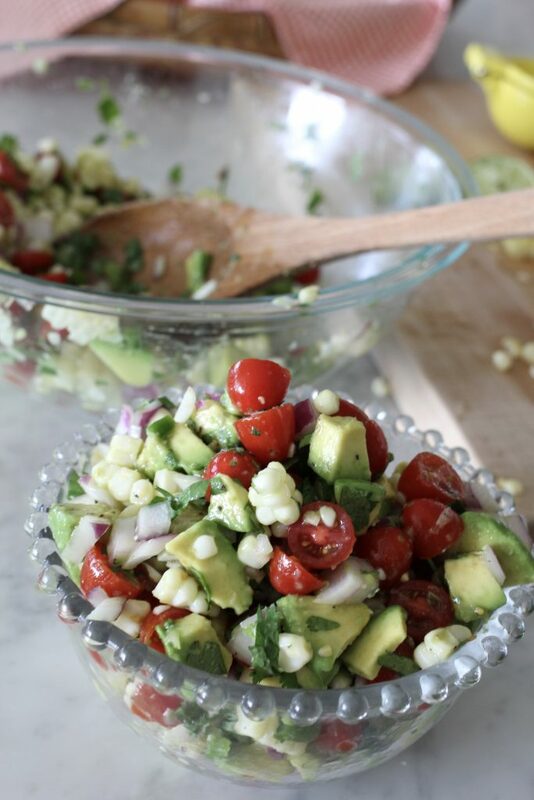 If the avocado is too ripe, it will coat the corn and tomato and the appearance of the salsa will not be quite as clean looking as in the photos. -I like Roma tomatoes in this recipe if you aren't using grape tomatoes. They do not give off as much juice or seed as other varieties.-Make sure to fold and not mix the ingredients. 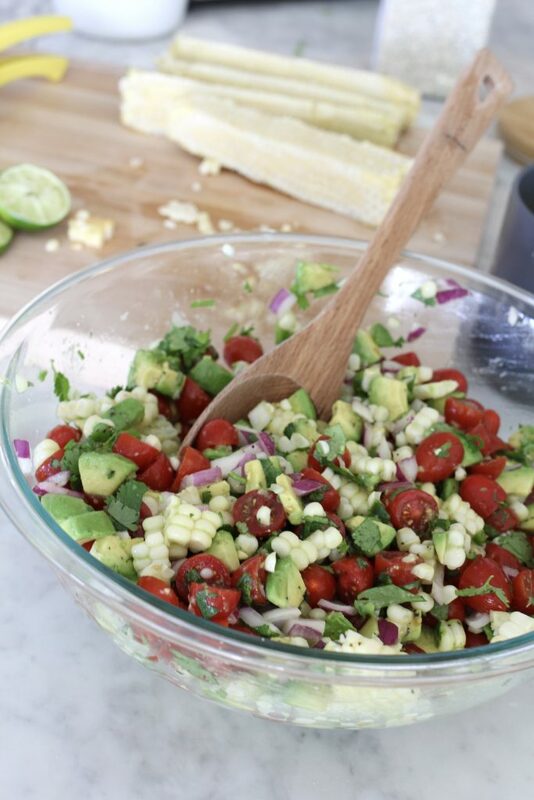 Mixing will produce a green (avocado) coated salsa. 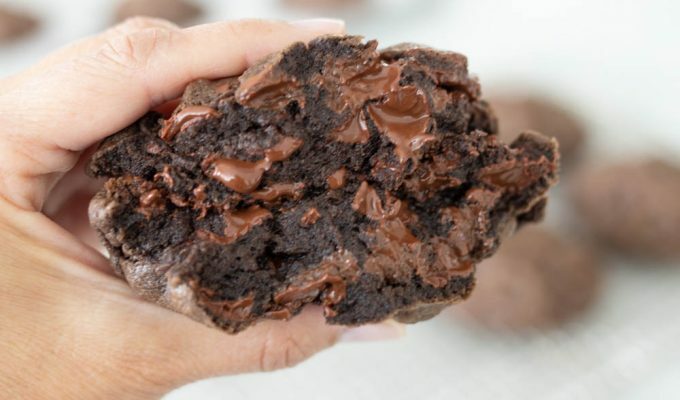 This is such a delicious recipe! HUGE hit with all of my dinner guests. Didn’t use jalepenos but still delicious.